This was a Wordpress site which was built and retro-fitted with a password protected client area system. Each client can be quickly allocated an id which allows them to login and view their own page to download reports. The home page features a flash video which plays seamlessly within the design, there's a jQuery cycle widget showing client logos and testimonials are randomly pulled from their own post category. 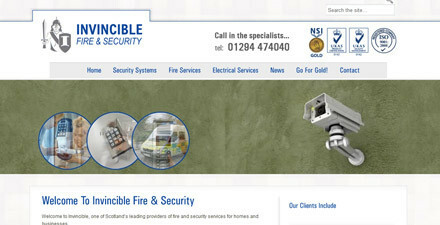 Invincible Fire & Security had an existing Joomla site, but wanted it replaced with something that was easy to update and performed well from and SEO standpoint. I decided to build the site in WordPress, including a Mega Menu, jQuery Cycle client showcase, randomised testimonial feed, and automated category view. During the development process a requirement arose for a client login area. I’ve worked with WordPress installs before that feature this, but they tend to be the kind of client area where all clients are given subscriber permissions and can then access the same client area. This was different, and much more granular. Each client was to get a username and password that would allow them to login and access their own unique page. The admin staff at Invicible upload their monthly reports and the client can acess and download them.